Colours play an important role in our daily life. Besides evolutionary influences, the use and perception of colour is determined by the context of each cultural sphere. The following connotations are connected to the pastel shade of pink: sensitive, delicate, youthful, unreal, eccentric, sweet, vulnerable and pleasurable. The colour encompasses both �high and low culture�. It is sometimes found �awkward�, even embarrassing, but on the other hand it is enjoyed, or it is quite simply associated with the idea of beauty. The stimulating aspect of work with pink is its inherent ambivalence. The impulse behind the artistic investigation is a desire to come closer to its enigmatic quality and to demonstrate this in a direct, differentiated way. As yet, there has been little research into pink, the colour with such emotional, contradictory factors. But during the centuries of fine art tradition there have been many powerful, outstanding works - including current productions - which have drawn attention to this subtle colour in a notable way. The list of international artists ranges from Jean-Honoré Fragonard, Caspar David Friedrich and Paul Gaugin to Pablo Picasso, Ernst Ludwig Kirchner, the early Joseph Beuys and includes contemporaries like Christo and Jeanne-Claude, Louise Bourgeois, Wolfgang Tillmans, Mike Kelley, Franz West and Minako Nishiyama, to name only a few. Pink is used to take a stand. It has its place. 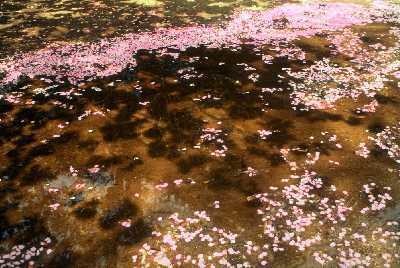 As well as in other contexts, in Japan the colour pink is associated with the blooming of the cherry blossom, the �Sakura�. This natural occurrence is also a highly-regarded cultural event. Every year, people devote considerable time and energy to a contemplation of the clouds of pink blossoming trees and the petals that �snow� down from them after only a few days. They are a symbol for the death of young warriors - of the Samurai - who fall in battle while in the full bloom of life. Looking at cherry trees, it seems that all-pervading sentiments of beauty and pain play an essential part. Knowledge of transience increases the aesthetic aura of pink. A further aspect is that here in Japan, this delicate colour is assigned to masculine themes.